The design of our organization is and was shaped by our concern for our people, our community, and our environment. We think locally, nationally, and internationally as well. Every year, we donate our time, money, and thought to solving problems and helping others, and we have since the beginning. Not only do we do this because we think it's the right thing to do, a good portion of Up and Running's team members have children, including the principals. We want the world to be a good one for them too, and we have chosen to help make that happen. We believe in education because that's one of the foundational components for improvement of the individual and society. We believe in sustainable green practices, and we think green initiatives must be economically sound for the longevity of the idea and practices. Our company was designed with this in mind, and our approach to business processes, software development, and internal and external interactions are all done efficiently with little impact to our planet, which in turn has enabled us to grow year after year while keeping our rates steady and competitive. The design of our organization is and was shaped by our concern for our people, our community, and our environment. Less driving, fewer emissions. Our organization is a virtual one, with people working from their home offices to support our customers. This eliminates commuting, and thus any carbon emissions. Work is often organized around family time so long as the goal of customer happiness is achieved. Up and Running is focused on results, meaning our team members have great flexibility in how they choose to organize their time so long as it works for our customers. Several of our team members use this flexibility to be available for their family during what are considered traditional work hours. As an example, instead of a late dinner, they're able to share most meals with their family. As another example, most of the kids' sporting events can now be attended. Less printing, less toner, paper, and other consumables. We strive to perform all work and marketing electronically, and rarely print materials for any reason. Ian McKilligan, our CEO, served as a board member of the Keweenaw Economic Development Alliance (KEDA). 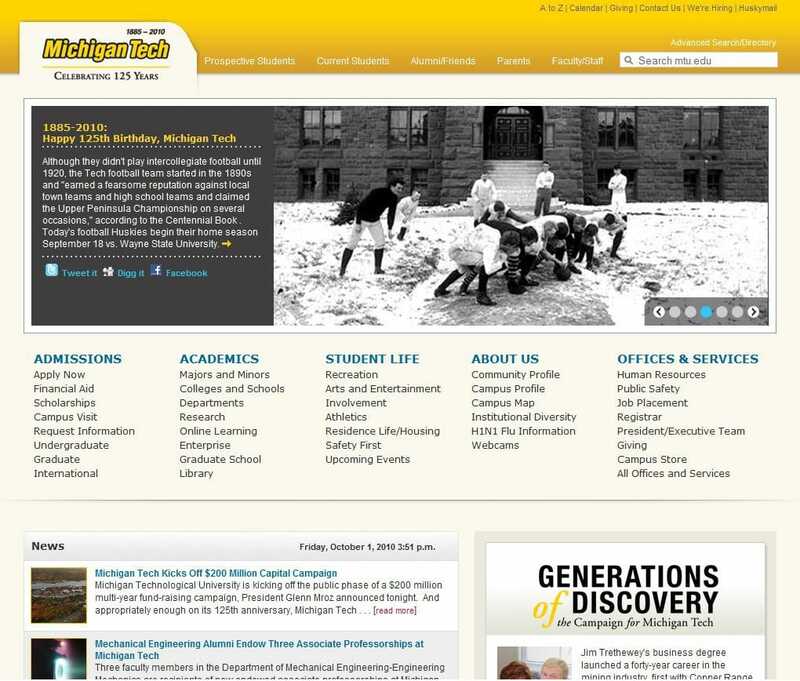 Up and Running Software, Inc. has donated to Michigan Technological University's (view home page) entrepreneurial initiatives. 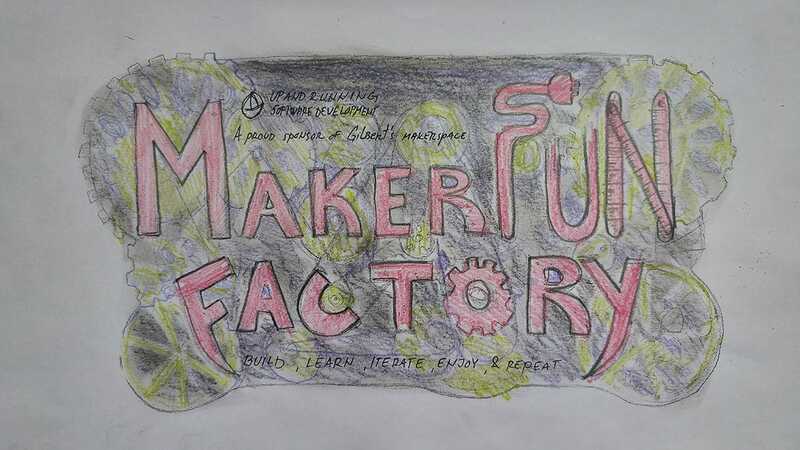 Peter Hanson, founder and CTO, has presented to school children about careers in information technology and his personal experience starting his own business (thank you letter ). Ian McKilligan has spoken to a Michigan Technological University class about pursuing a career in IT, as well as managing operations in an IT organization (thank you email ). He also spoke for a Michigan SmartZone (state-led effort to promote growth and collaboration (PDF ) event where local entrepreneurs gave their stories to students as a means of promoting entrepreneurism and motivating them to start or join new ventures. 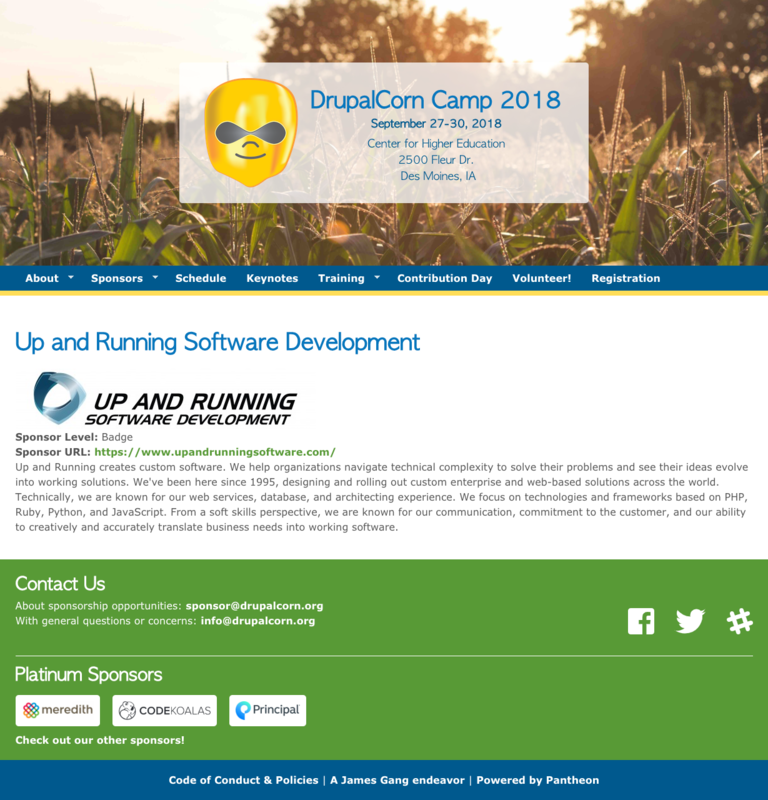 Up and Running supported an open source initiative with free hosting and server resources, as well as contributed financially to other open source related activities. 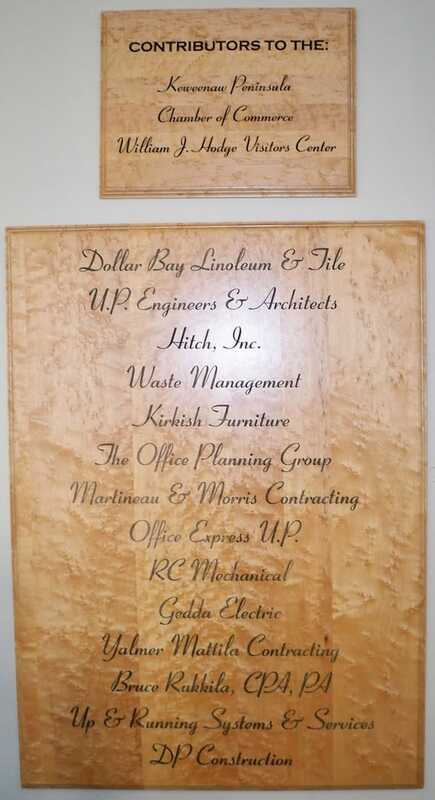 We've also supported the Chamber of Commerce in Houghton, MI with free technical services (click to open image to see how they honored us with our name on a plaque that resides in their office). 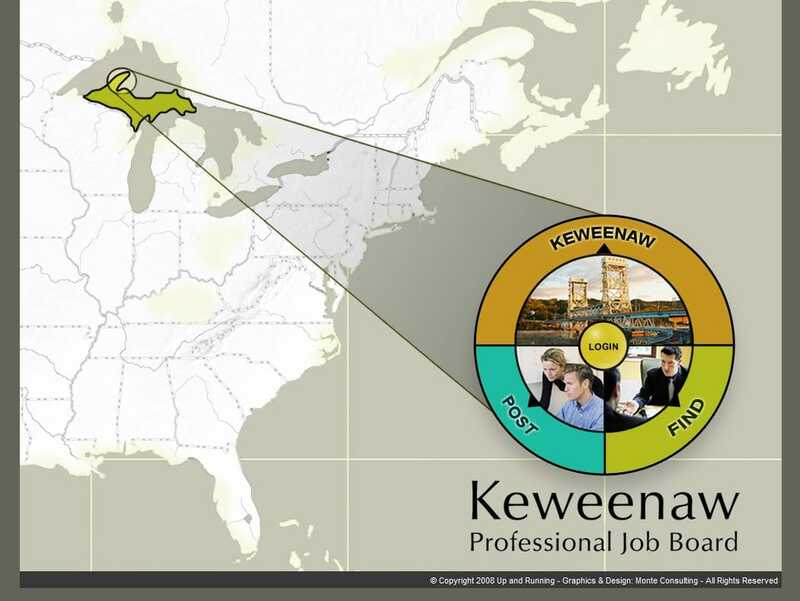 We provided thousands of dollars in services to help create (all software development and hosting ) a jobs site called the Keweenaw Professional Job Board (view home page), where local businesses can post their jobs for free. 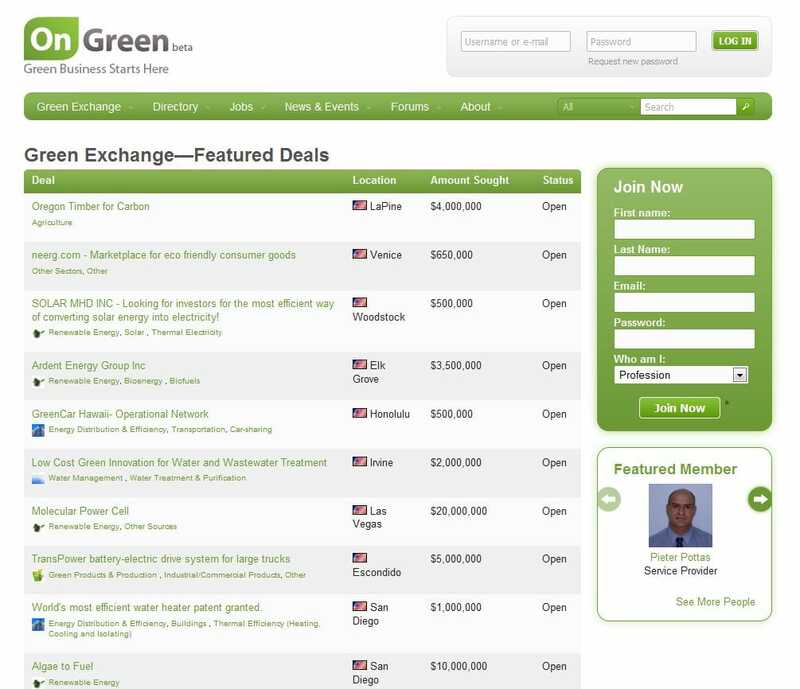 To that end, we've provided pro bono technical consulting and support to OnGreen.com (view home page), the world's largest green business resource center. We were an early adopter of cloud computing because we knew its economies of scale would be able to provide better computing power cheaper and with less of environmental impact. We operate in a virtual environment, and perform nearly all of our work electronically. This reduces carbon emissions and consumption. 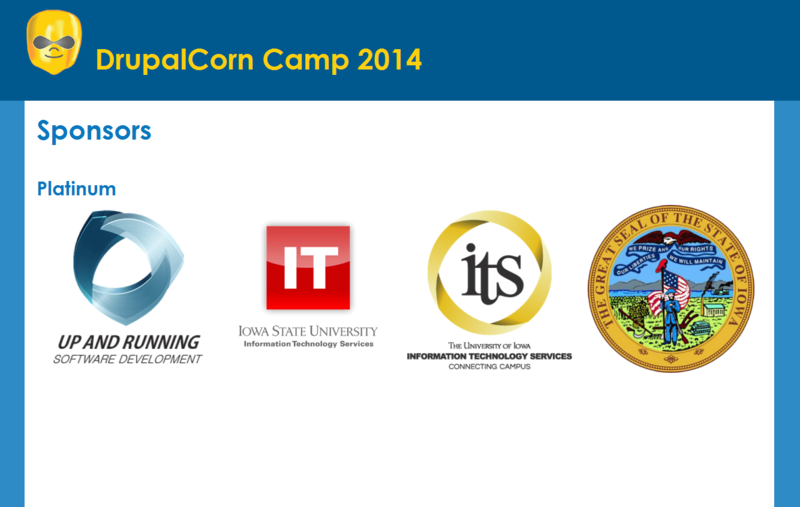 Our CTO is a Technology Association of Iowa Workforce & Education Committee Member. "The Technology Association of Iowa (TAI) is the premier professional organization accelerating the success of Iowa's technology industry and tech-based economy." This TAI committee is focused on K-12 technology education, as well as technology education for those in the workforce. Our CEO taught a class at Michigan Technological University on Information Systems Management. Our CTO presented a lecture to the Ames IT community on 2/13/15 about lessons he’s learned after serving over 500 clients after providing technical and software services for over 20 years (image of invite | link to presentation ). Since 1995, we have served over 500 Clients through our company. 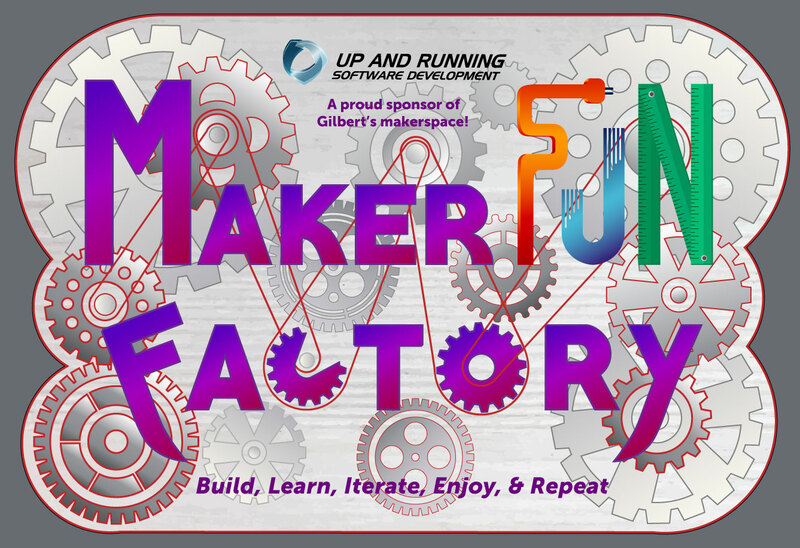 They've taught us a great deal over the years, something we’re very grateful for, and this was our attempt to distill those lessons learned into a presentation for members of the local IT community. We hope something in there is useful to you if you choose to read it. Our CTO gave a lecture on Agile to an Iowa State University class learning about software development (link to presentation ). This was a high-level presentation about the agile software development process, which was given to Jivko Sinapov’s Iowa State University Class, titled "HCI 573X: Web Applications", on April 25th of 2014. 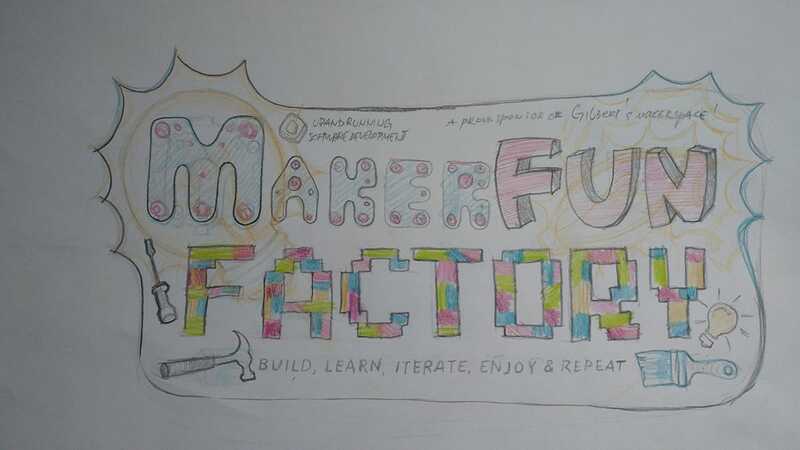 It covered a range of topics related to the Agile methodology, presented examples at various levels of detail, and gave some next steps they could take if they wanted to learn more. 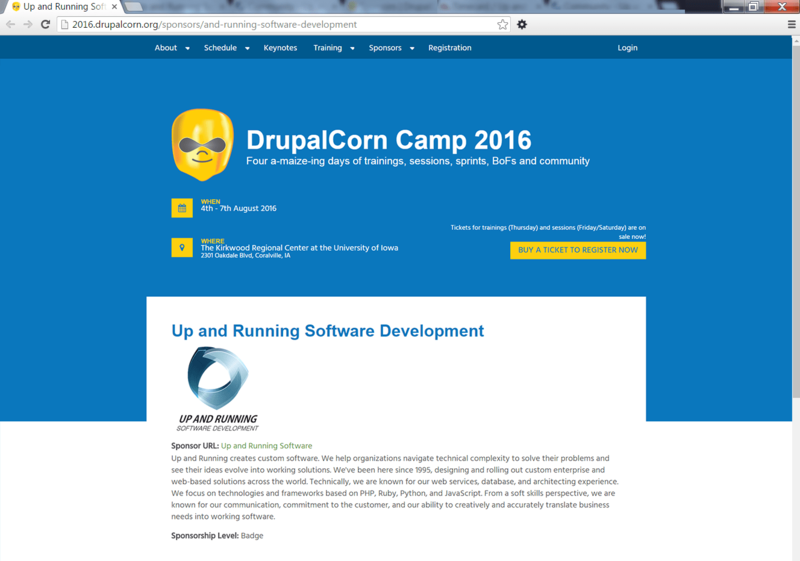 We’ve supported DrupalCorn, an educational Drupal (a mainstream open source PHP content management system and framework) event that helps developers and Drupal users learn more about the framework and network with peers. 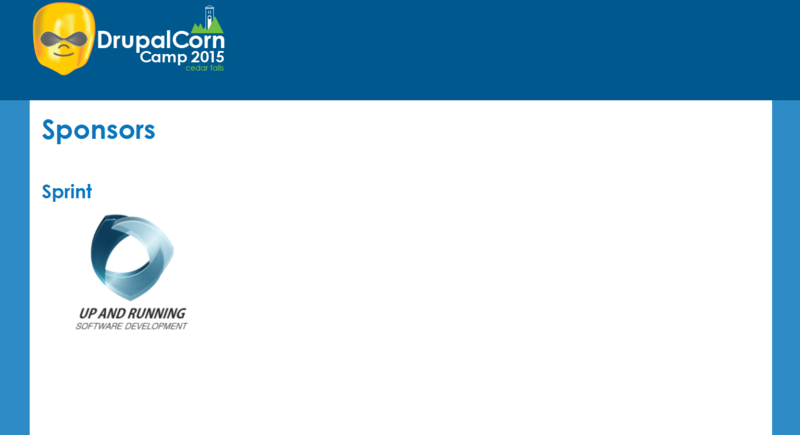 Here’s proof of our 2014, 2015, and 2016 (thank you card), [there was no 2017 event], and 2018 (thank you card), DrupalCorn Sponsorships. Our founders regularly donate their time to help individuals and organizations learn more about business, software, and working with people in general. 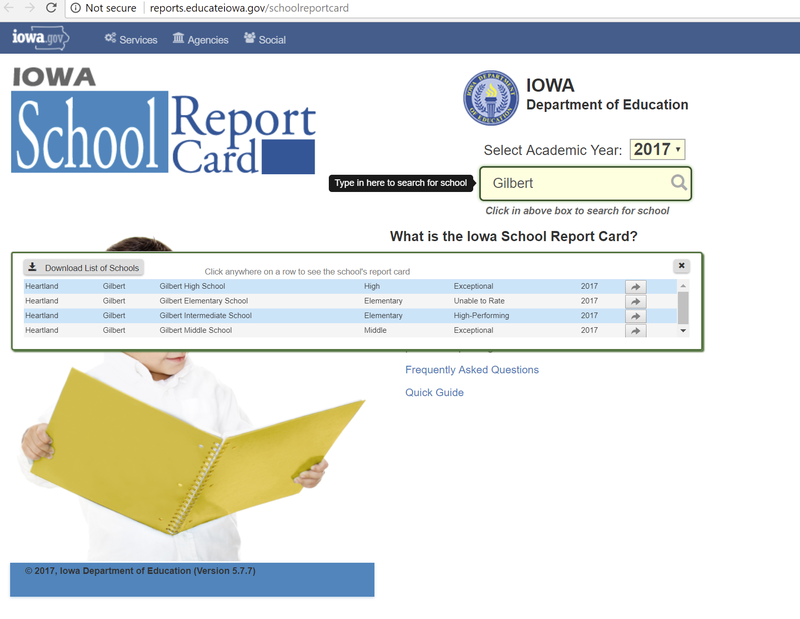 We supported an online pre- and post-survey used to research means to improve science performance at the high school level as measured by ACT scores. Our CTO has mentored students not affiliated with and not working for our company. 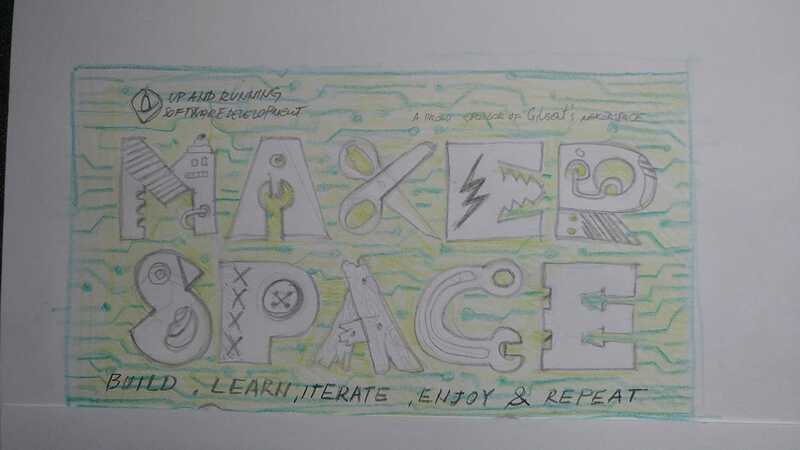 For a recent one, he provided his recommendations on educational materials, and, in part by using lessons learned from those materials, she secured the job she was aiming for. We've provided education in the form of martial arts to practitioners and organizations that seek more awareness and confidence on the personal security front. 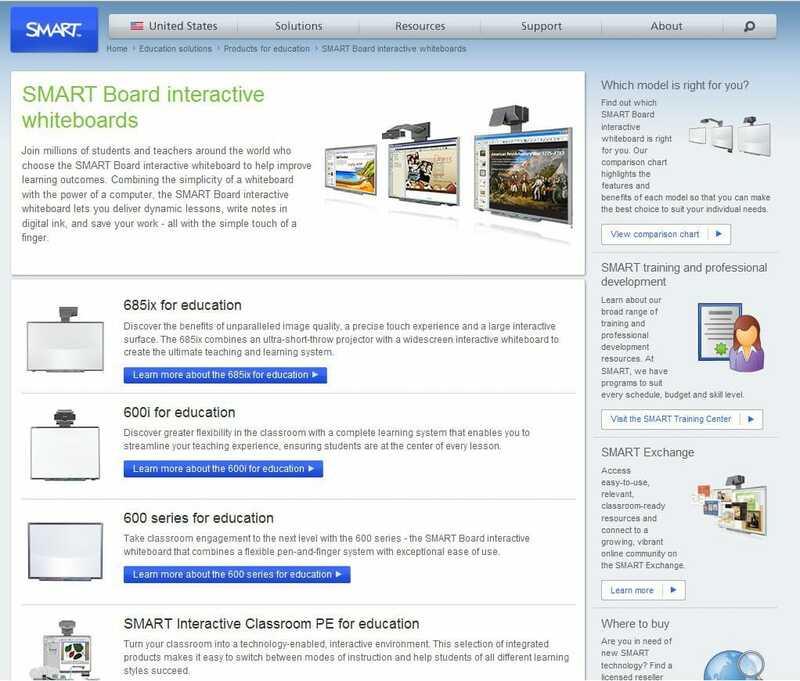 We donated a SMART Board (view site) to the Joplin, MO school system, and this prototype resulted in more SMART Boards being purchased for the classrooms. This has helped both the teachers and the students. We've donated to the Houghton, MI library, and they honored us by placing a book in our name on the donation wall (click to see image). We have provided financial support to Houghton High School events. We’ve supported Future N Focus with strategy and support in addition to doing paid development work for them. The purpose of this site is to help people have meaningful and fulfilling lives, and Steve Ward is driven to help people in this area. Please read more about the solution on www.indiegogo.com (PDF version ) and www.futurenfocus.org (Screen Shot ). We supported Commission on Adult Basic Education financially in addition to doing paid development work for them. "The Commission on Adult Basic Education is organized to advance national and international adult education and literacy opportunities for all persons." (Source and more about them: http://www.coabe.org/mission/ ). Up and Running has worked with other education-focused clients, including Essential Education, Yale (through an agency), Michigan Technology University, University of Maryland, George Mason University (through an agency), and Daemen college (through an agency). We consider ourselves to be very fortunate to work with our partners in education, whether it be a project focused on research, data collection and analysis, or services in support of their stakeholders, namely students and everyone on the planet. Up and Running donated founder time to Iowa State University to help them assess options and an approach for creating a new seed database. In 2017, we had the honor of supporting a great, local initiative in Iowa. All Aboard for Kids (http://allaboardforkids.com/about/ ) is a summer day camp for children on the autism spectrum. Some of the benefits for the children and the community include: preventing cognitive regression, easing the transition to the next school year, encouraging social skills development with peers, promoting physical activity and the practice of gross motor skills, and bringing the community together to help kids in need as many people and organizations are working together to make this happen successfully. 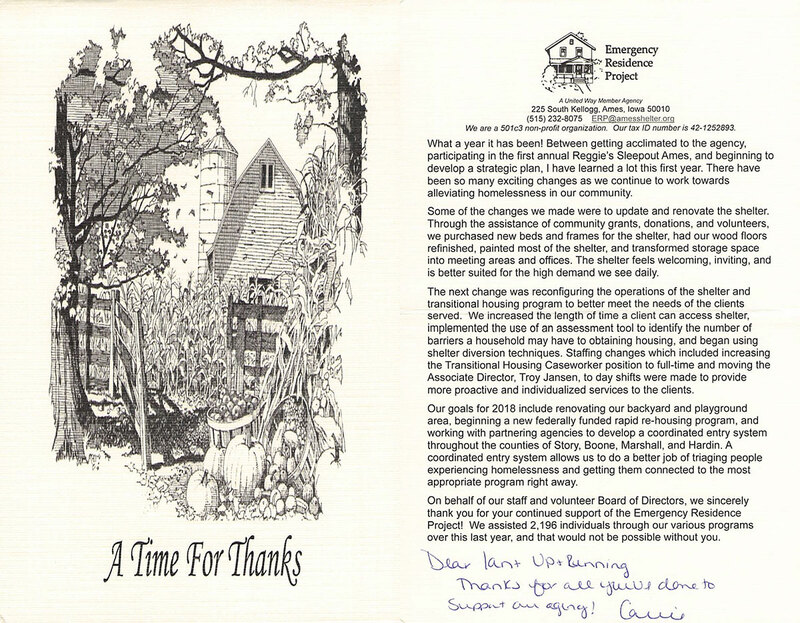 Here is Mike and Lisa McCarty’s thank you letter on behalf of the organization for our contribution. In 2018, we continued our support of All Aboard for Kids by donating $2,000 to help fund a summer camp for children on the autism spectrum. Please see what great things that helped to accomplish in their President’s thank you letter. 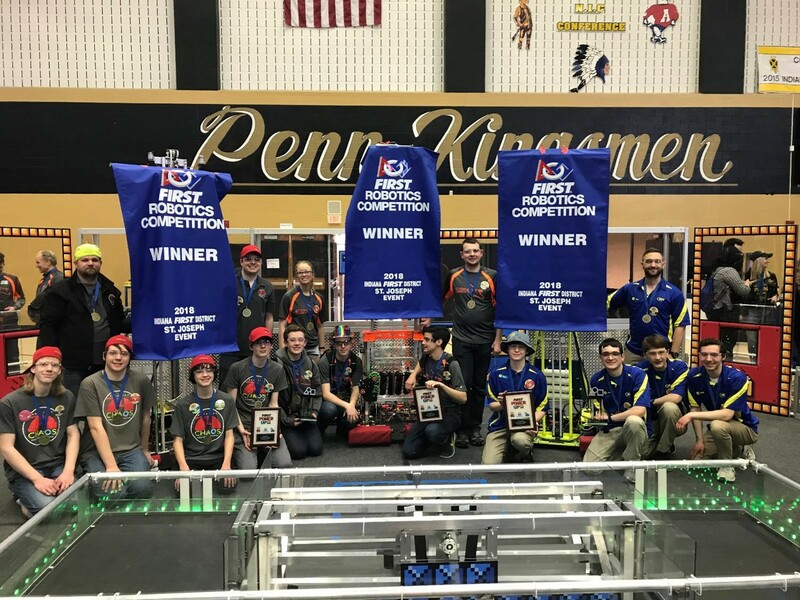 Up and Running Software donated $1,500 to FIRST Robotics Team 74 in Holland, MI (see thank you letter ) to buy computers for the team's programming lab (view lab, view computers). 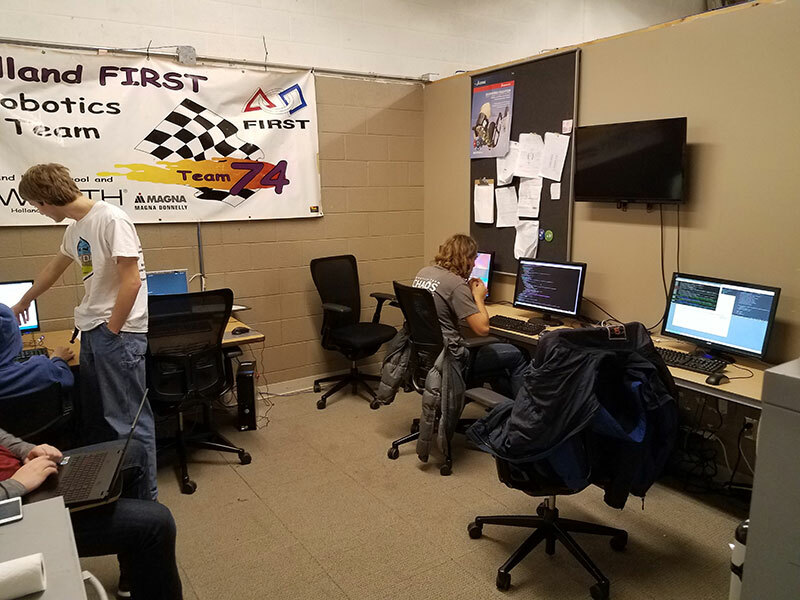 FIRST Robotics is a high school robotics competition that gives students real-world engineering and programming experience. 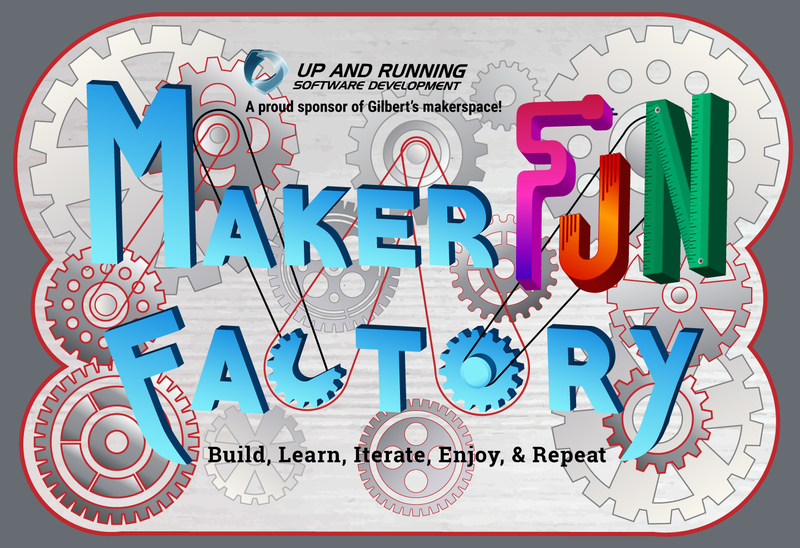 One of Up and Running's Senior Development Architects also serves as a mentor on the team, spending 150+ hours per competition season working with students learning to build and program robots. 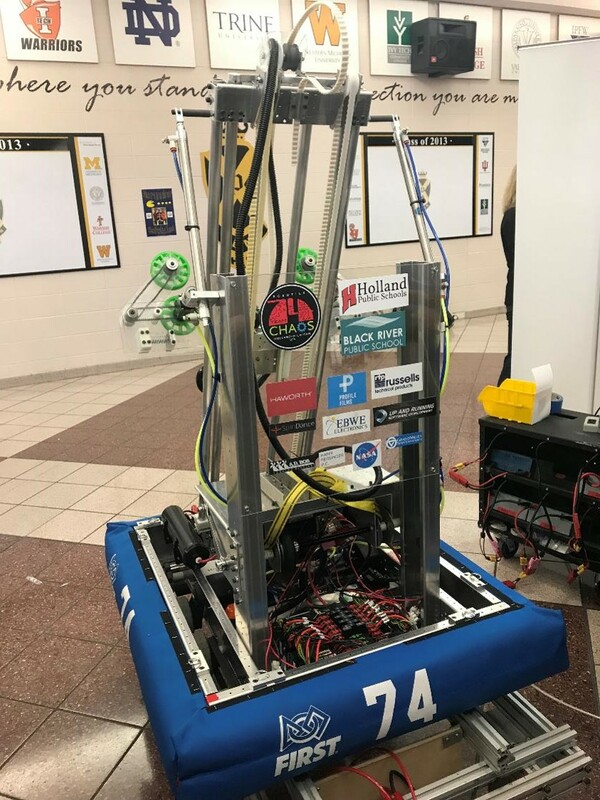 In March of 2018, 36 students from Team 74 travelled to a competition near South Bend, Indiana. There, they put their robot to work, and they performed well, bringing home a victory as a member of the winning alliance. 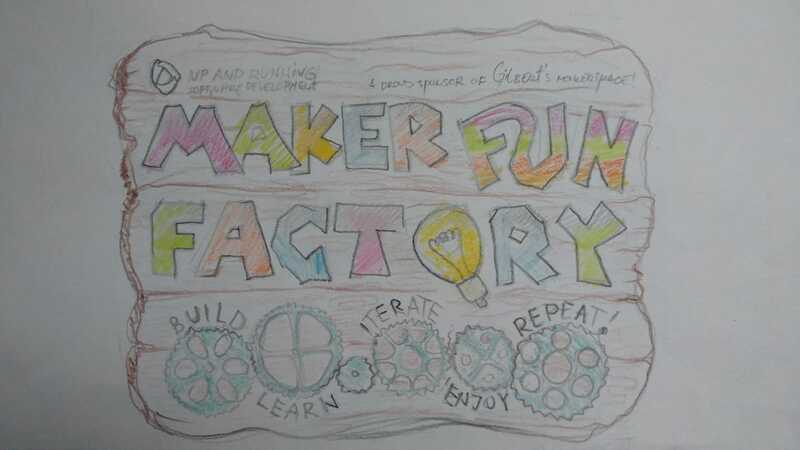 Here’s our (sponsorship thank you letter ), as well as a picture of the team and a picture of the robot (please note the Up and Running Software sticker on the right!). 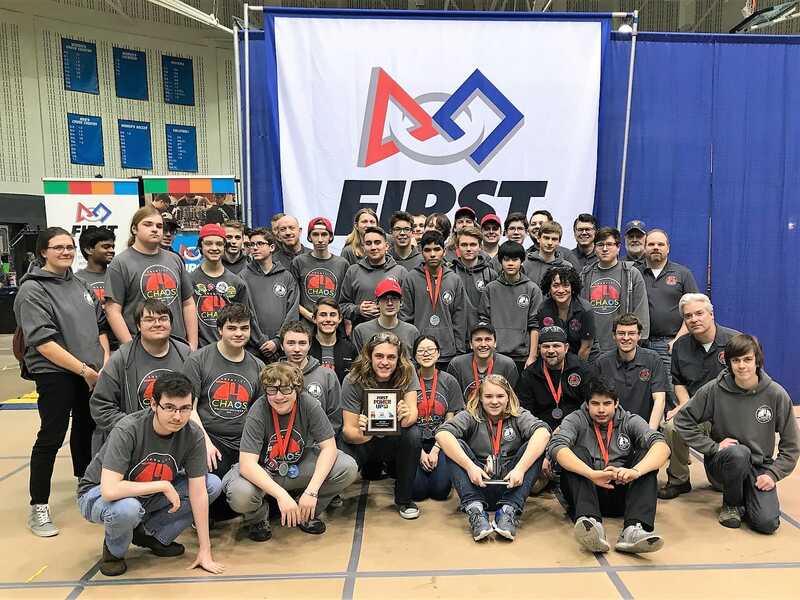 Also in March of 2018, Bill Ehmann, a Co-leader of the team, had this to say of an event in Shepard, MI, “[…] Team 74 competed at GVSU in the West Michigan District Event. Team 74 had another strong showing, finishing as the event runner-up. Additionally, Team 74 received the Gracious Professionalism Award sponsored by Johnson & Johnson, which is given to the team that most demonstrates a professional attitude and a desire to support other teams.” Up and Running is most proud of their winning the Gracious Professionalism award; that says a lot about the caliber of students involved. Here’s a picture of the team from the event. 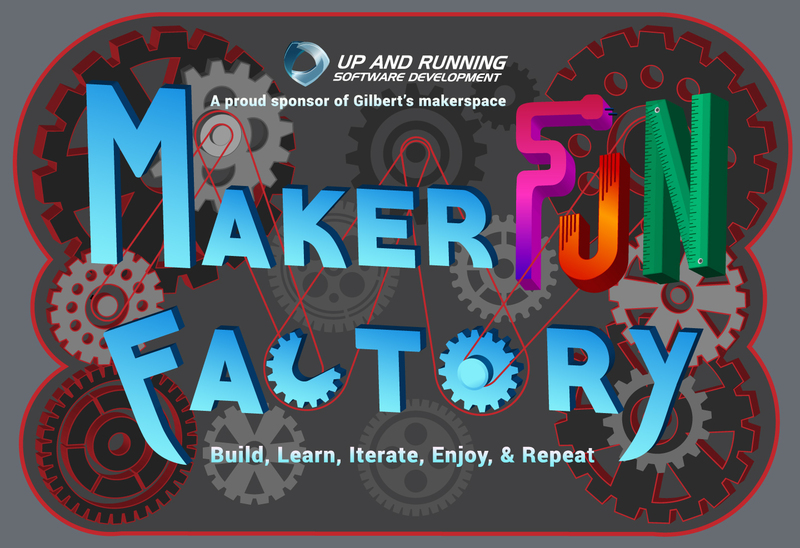 In February of 2019, Up and Running Software donated another $1,500 to Team 74 (see the thank you letter ). The funds will be used to support their 2019 season. We’ve donated goods to Raising Readers in Story County (see thank you letter for fridge | see thank you letter for book bags ). We really like their vision, “Raising Readers in Story County is committed to a future in which generations of young children get a solid foundation in reading, communicating, and learning. 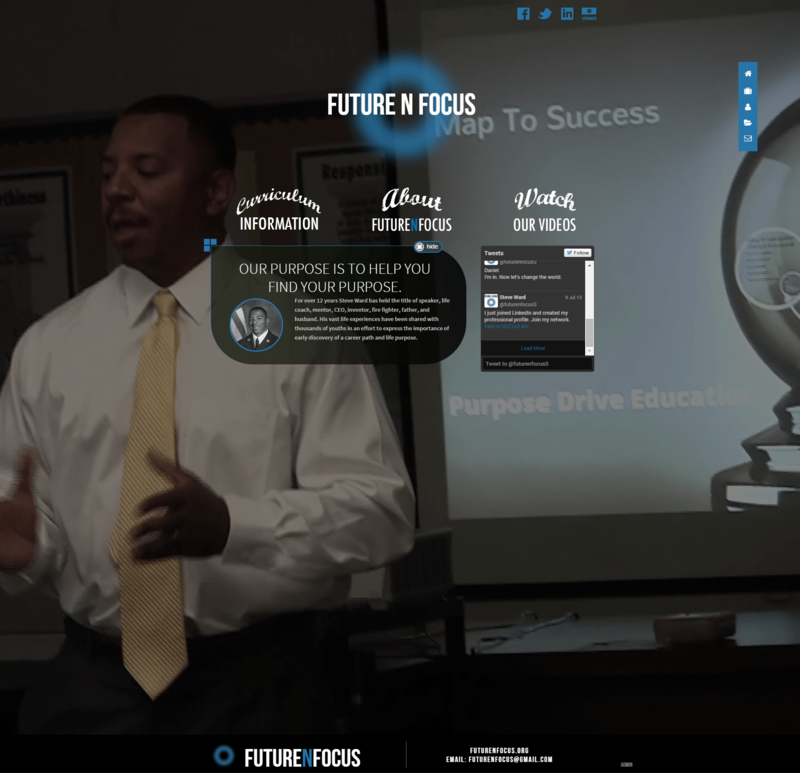 This will help prepare them to become successful students, citizens, and workers." In April of 2018, we donated $3,000 to Raising Readers to sponsor the Eastwood Storytime program in Ames, IA. Here’s what this supports exactly for a year’s time, “Our Storytime program benefits many children from families with low-incomes who live in the Eastwood Apartments in Ames, Iowa. By supporting this program, we are able to bring literacy activities to the school-age children who may not otherwise get to experience this type of program. Twice a month, we provide snacks, craft activities, a group story time, songs, and individual reading opportunities with volunteers who help make this program possible.” Here is their thank you letter for the sponsorship, as well as their thank you letter for attending one of the reading sessions. We donated $2,600 to Reggie’s Sleepout (here are the two thank you letters: $1,000 and $1,600 ). 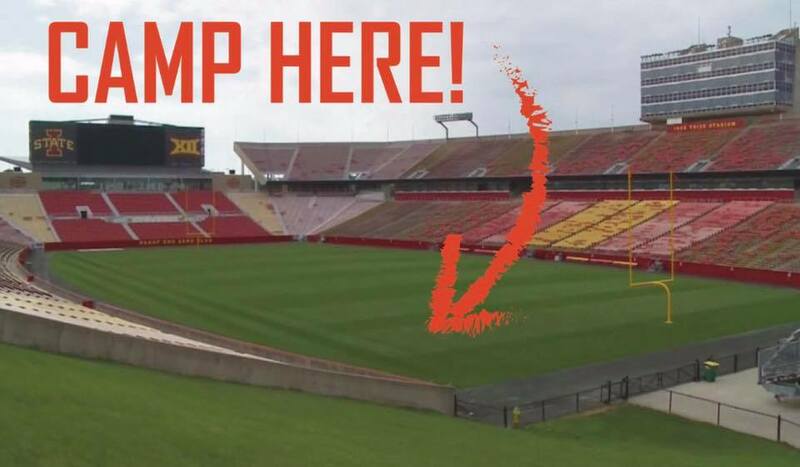 The Ames, IA version of this event usually takes place at the Jack Trice Stadium of Iowa State University (image), where fundraisers camp overnight in tents or cardboard shelters to lightly replicate what it’s like to be homeless for an evening. The funds raised by these campers go to important, local Iowan organizations that help people immediately with shelter, addiction treatment, and abuse survivor support services. In the long-term, they enact change in our community so the need for these services are reduced. These organizations include: YSS (https://www.yss.org/about-us/ ), ACCESS (https://www.assaultcarecenter.org/en/about_us/ ), and The Emergency Residence Project (http://www.amesshelter.org/mission-vision-values/ ). We sponsor four children annually through the great work of Compassion International, which is an organization that helps children in extreme poverty. Compassion International helps by providing educational opportunities, key life skills training, health care, supplements to protect against malnutrition, recreational activities, and protection from crime, violence, and danger. Rotary is a worldwide organization with over a million members focused on combating hunger, improving health and sanitation, providing education and job training, promoting peace, and eradicating polio (source ). 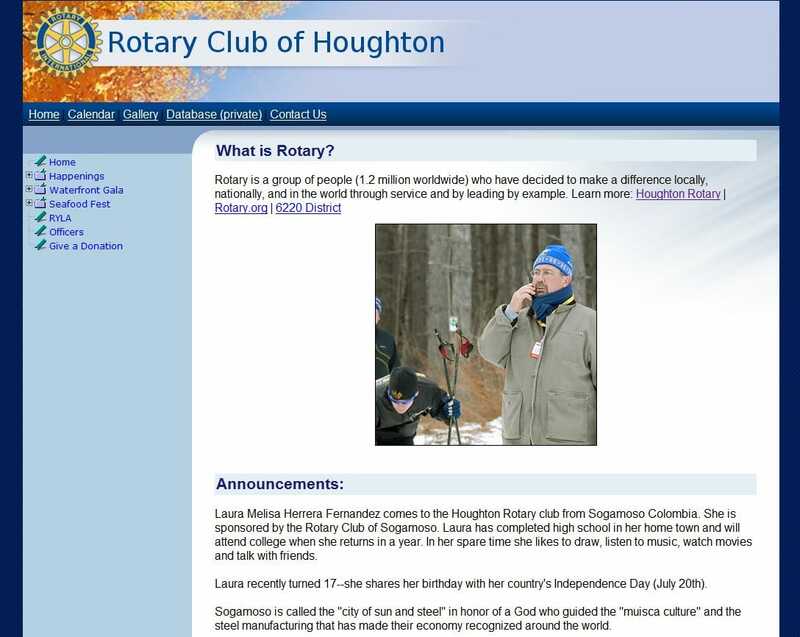 We've helped Houghton Rotary with their website (view home page), though we don't manage their content. We have also helped this organization with their fundraising efforts by providing web services that have processed thousands of dollars for their club. Roger S. Helman, J.D., CFP ®, a former Houghton Rotary President wrote, "Ian and his company have provided invaluable professional assistance to Rotary over the past year, helping with various tasks, such as: the Tri-District President-Elect Training Seminar registration process, which I personally utilized without any problems; on-line ticket sales and appropriate content for Houghton Rotary's Seafood Fest; and on-line registration for Houghton Rotary's Centennial Gala. Ian's willingness to help, as well as his availability, experience and depth of knowledge have proven to be most impressive (see full letter of recommendation )". Houghton Rotary has thanked us publicly for our efforts as well (see an example thank you letter ). We’ve continued to support Rotary over the years, with Pete Hanson becoming a member of the Ames, Iowa Rotary Club, wherein he’s helped with clean-up initiatives, fundraisers, and technology donations. Also, in 2017, we donated $1,000 to Houghton Rotary in support of a major fundraiser, the funds from which will support local-to-global initatives (see thank you letter ). In 2017, Hurricane Harvey is estimated to have caused $125 billion in damages, displaced 30,000 people, and caused many injuries and fatalities in Texas and Louisiana, with effects reaching as far as Arkansas, Alabama, Tennessee, and North Carolina (wiki: https://en.wikipedia.org/wiki/Hurricane_Harvey ). Some of our customers were affected directly. Given all of this, we thought we should lend a hand, and we sent $2,000 to the cause. A client recommended we donate it to the “Houston Flood Relief Fund” via YouCaring, which we did (proof). 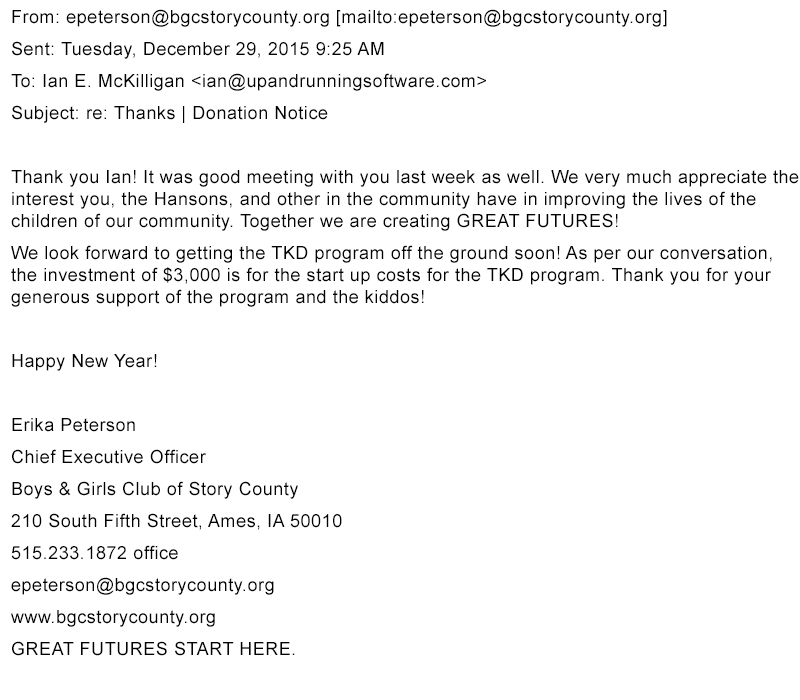 In 2017, we donated to a Boys & Girls Club of Story County fundraiser called “Over the Edge”; here’s their thank you . An owner of Up and Running Software ended up rappelling down one of the taller buildings in Iowa State’s Campustown (Ames, IA). Unfortunately, perhaps purposefully, he left his GoPro at home. We’ve donated to the Gilbert, IA fire and emergency response agency in support of their services and the building of a new station. Here’s the thank you letter from the Gilbert Fire and Emergency Response Agency (thank you letter ). In 2017, we donated $500 USD to the Red Cross to help people impacted by the severe wildfires in British Columbia, Canada in support of our Canadian team member(s) and customers. At the time of writing this, nearly 400,000 hectares, or almost 4,000 square kilometers, had burned. 2017 has seen the largest wildfires in the province since 1961, with many occurring near towns. The donation helps to provide “immediate relief such as cots, blankets, family reunification and financial assistance for food, clothing and personal needs.” Here is proof of our donation . 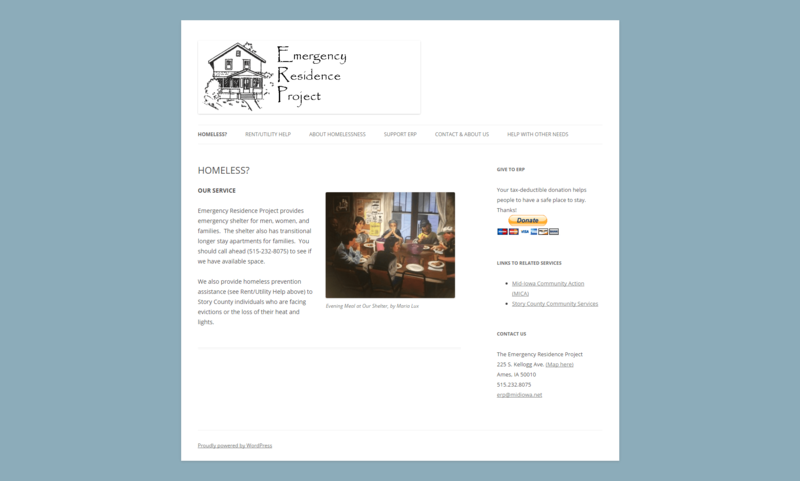 The Emergency Residence Project (screenshot of home page) "provides emergency shelter for men, women, and families. The shelter also has transitional longer stay apartments for families. They also provide homeless prevention assistance (...) to Story County individuals who are facing evictions or the loss of their heat and lights." 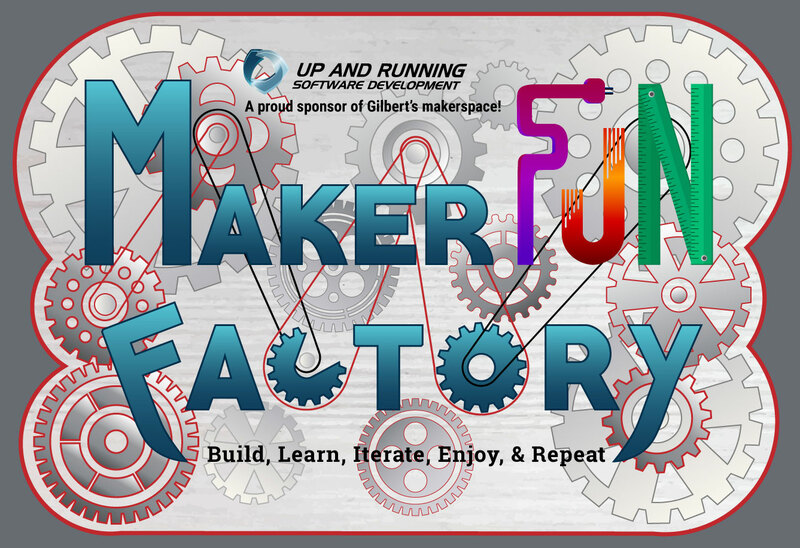 Up and Running has supported this great organization financially since 2013. Here is a thank you letter from them. So as not to neglect our closest relatives, we donated $250 to the Ape Cognition and Conservation Initiative (ACCI), http://apeinitiative.org/ , which is a research facility in Des Moines, IA that studies and homes the endangered bonobos. 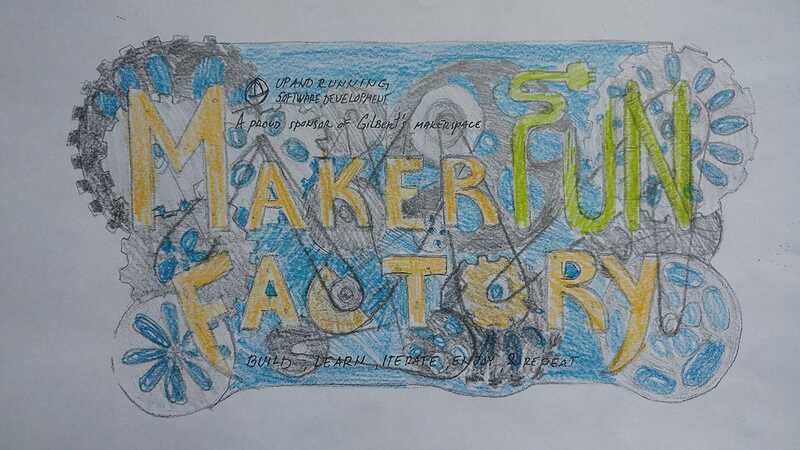 They house a world-famous bonobo named Kanzi who can comprehend English, communicate with a Lexigram keyboard, make and use tools, and paint. ACCI focuses on science, conversation, and civic engagement, including STEM initiatives. Here is proof of our donation . We’ve donated thousands of dollars to fight cancer (proof of donations: American Cancer Society | Breast Cancer Fund | Beat Cancer Today in 2017 & Slide | Beat Cancer Today in 2018 ). The latter does a lot for Iowa in a direct manner; here’s what they’re about, "Formed by Iowa families whose children have been diagnosed with childhood cancer, Beat Cancer Today's mission is to create awareness of childhood cancers and to provide financial support for childhood cancer research, and for patient and family support programs." Youth & Shelter Services, Inc. has received donations from the company and its owners on multiple occasions (click to view two thank you letters ). "YSS exists to provide prevention, education, treatment, and residential services to children, youth, and families, to advocate on their behalf, and to help them solve problems, grow, and be self-sufficient, responsible, contributing members of society. We strive to help children, youth, and families uphold dignity, build assets, and achieve independence source. (source )"
One of our clients, Nexleaf, is funded by the Gates Foundation and Google to help people across the world. We helped a lot with their ColdTrace software, which "reimagines the cold chain infrastructure used to store and transport vaccines by enabling a low-cost wireless sensor to remotely monitor vaccines and transfer the monitoring data to a global database that fosters coordinated decisions by governments, global partners, pharmaceuticals, and clinics, and helps ensure life-saving treatments reach everyone (source: http://nexleaf.org/vaccines )." 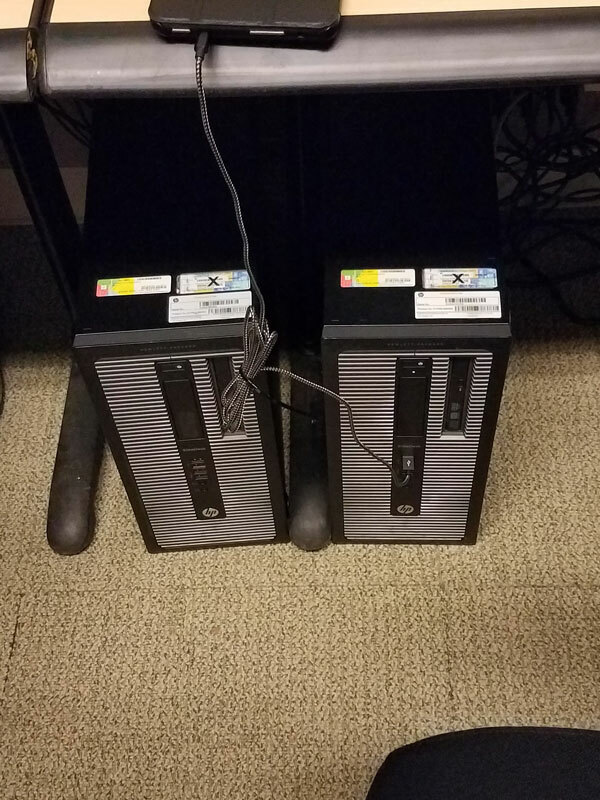 We donated in two ways: discounted rates without any sort of retainer (what we usually ask for if someone wants discounted rates) and a donation of $19,660 worth of software development to help them reach their goals within budget. We've donated technical services and money to the Keweenaw Family Resources Center (view home page), an organization dedicated to helping families with young children since 1991. They have a great mission: "The mission of the Keweenaw Family Resource Center is to support, enrich, and strengthen family lives in the Keweenaw Peninsula by providing a variety of programs that focus on families with children from birth through four years of age. (source )"
Peter Hanson oversaw the Amber Alert website to help find missing or kidnapped children through the Joplin Globe. We once supported the Keweenaw Community Foundation with all of their technical needs, as well as financially, which we still do today. 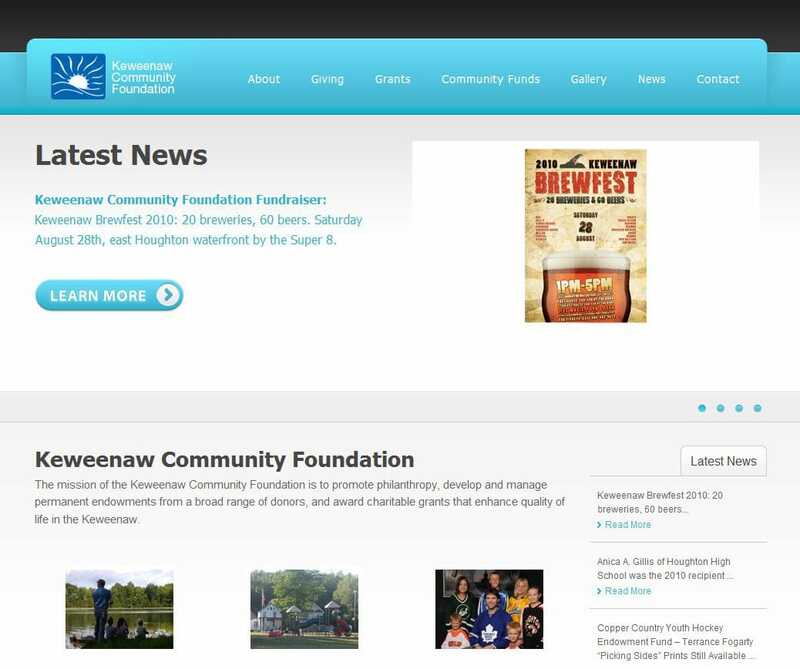 Their mission is "to promote philanthropy, develop and manage permanent endowments from a broad range of donors, and award charitable grants that enhance quality of life in the Keweenaw (view home page)". Barb Rose, their Executive Director at the time, says some kind things about some of our help in this thank you letter . 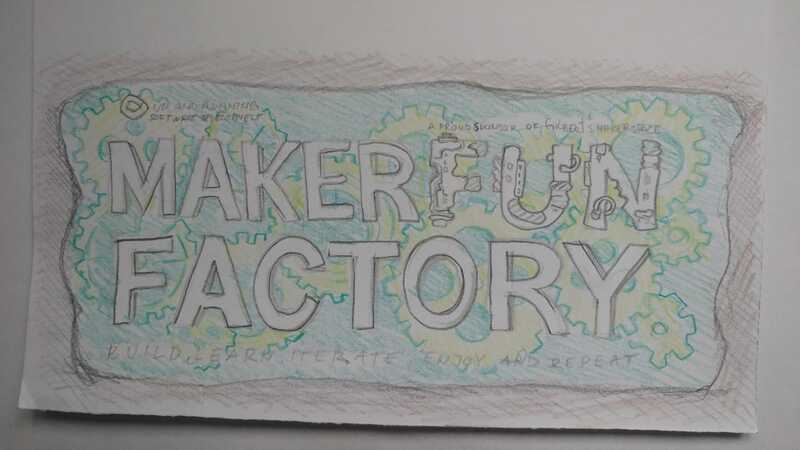 In 2016, we contributed to the Community Brick Project, facilitated by Keweenaw Community Foundation, by donating $1,200 in support of a new walkway at Houghton’s "Ray Kestner Park"; here is the thank you letter for that. In 2017, we helped by contributing to a community building and awareness fundraiser; here is the thank you letter from Jim Vivian III, their Executive Director. In March of 2017, we helped out our local community care of a great organization, dsmHack, which is a "a not-for-profit organization working to elevate and strengthen the community by building software, learning from each other and giving back. 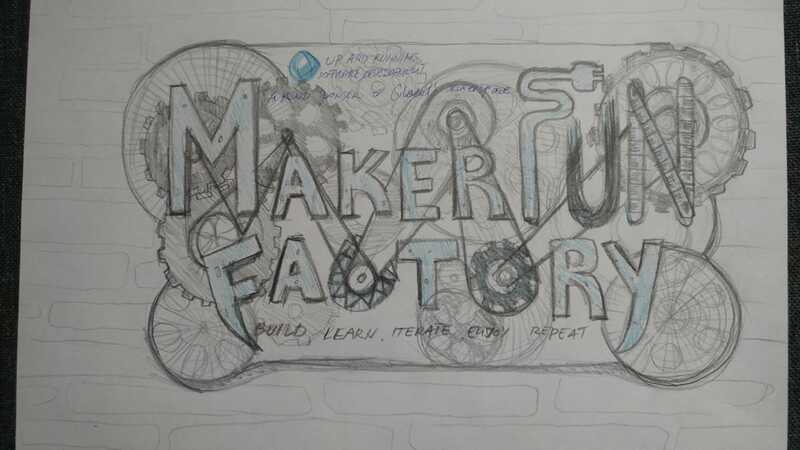 The organization centers around the idea of ‘Build.Learn.Give.’, which includes building technology solutions and relationships throughout the community, learning new skills or thought processes and giving time and skills to nonprofits who need, but cannot afford it." Thousands of dollars of time was donated over a course of three days, including an all-nighter!, to help build an audition management solution for the Iowa Dancer Theatre, established in 1983, whose "mission is to raise awareness, develop appreciation, increase opportunities and support dance as a performing art within our community." 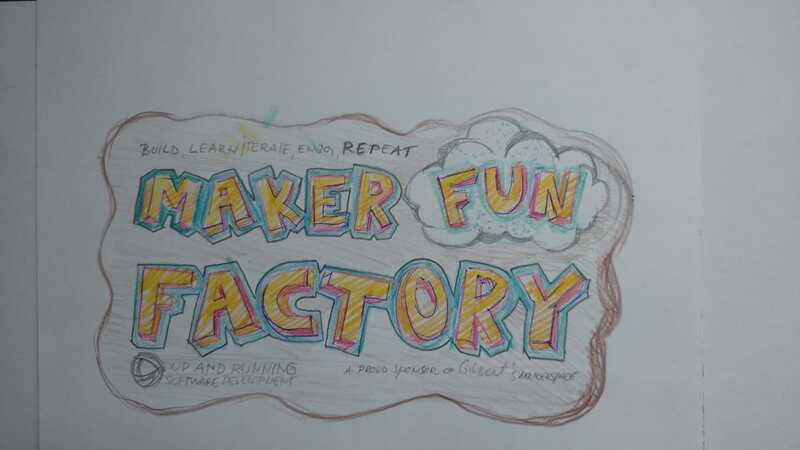 The current-state auditioning process was paper and time intensive, and the system that many dsmHack attendees, not just Up and Running, created together enables the volunteers at this long-standing Des Moines, IA organization to focus on their mission, the kids and the community. 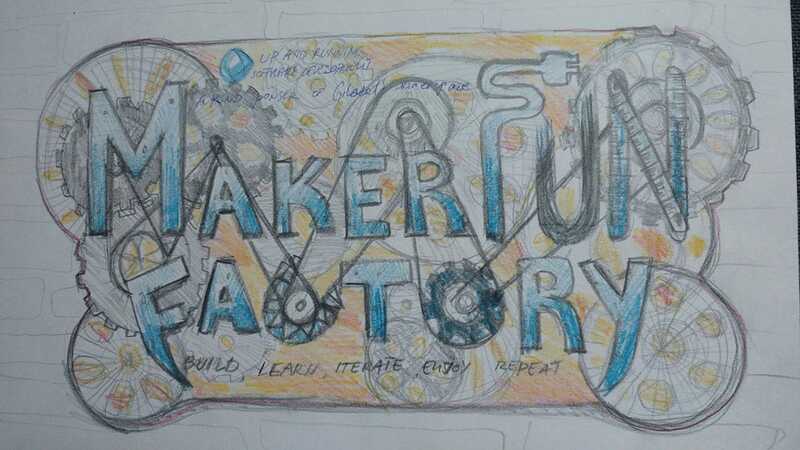 The plan is for the resulting production system to be open sourced by the Iowa Dancer Theatre for use by anyone, hopefully helping a lot of theatres, dance groups, and more across the nation and even world to manage their auditioning processes. If you like technical details, the stack selected was Java, Ember.js, MySQL, Amazon Web Services (AWS), and Jenkins for continuous integration (CI). More about dsmhack . More about the Iowa Dance Theatre . In May of 2018, our CEO contributed time at Gilbert Community School’s Multicultural Night, an event that presented and celebrated the many cultures within the school district. Here’s their see thank you letter . Our founders, both blackbelt-level martial artists, have donated time to school children, college organizations, and crisis intervention specialists to help them learn basic personal security measures such as how to escape from common grabs and attacks, as well as how to avoid situations altogether via awareness and proactiveness. In the classroom, we helped people of all ages and from all walks of life learn about martial arts and the physical and mental benefits they afford. 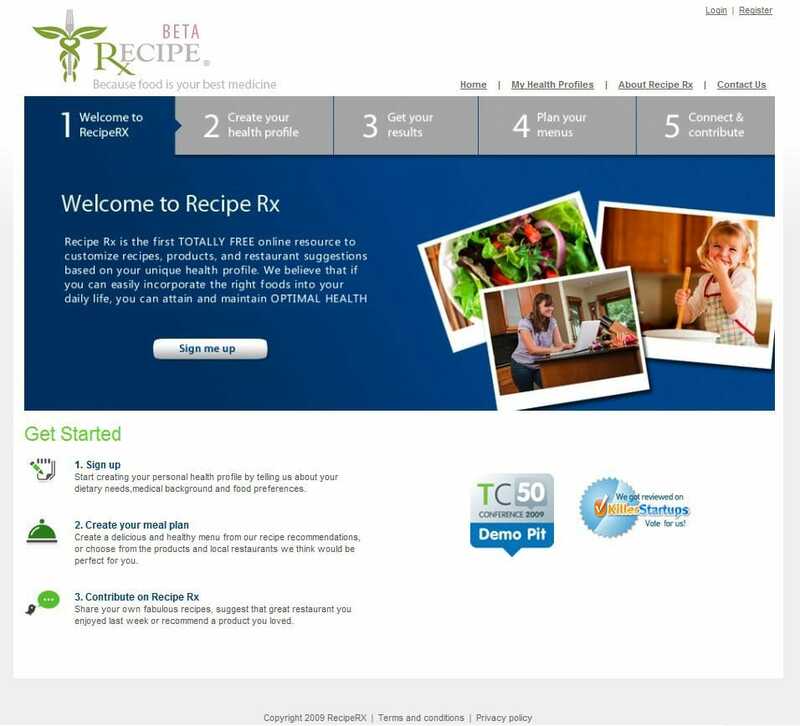 We've supported RecipeRx (view home page), a company dedicated to helping people eat well based on their personal health profile and needs. We've donated to the Portage Community Foundation in support of the mission of Portage Health, which is to "To improve the health of our community by providing the highest quality healthcare services." We've supported Home Health organizations and organizations that assist families in finding the healthcare services they need. We believe in athletics because it's educational for many reasons and provides positive community-building activities. 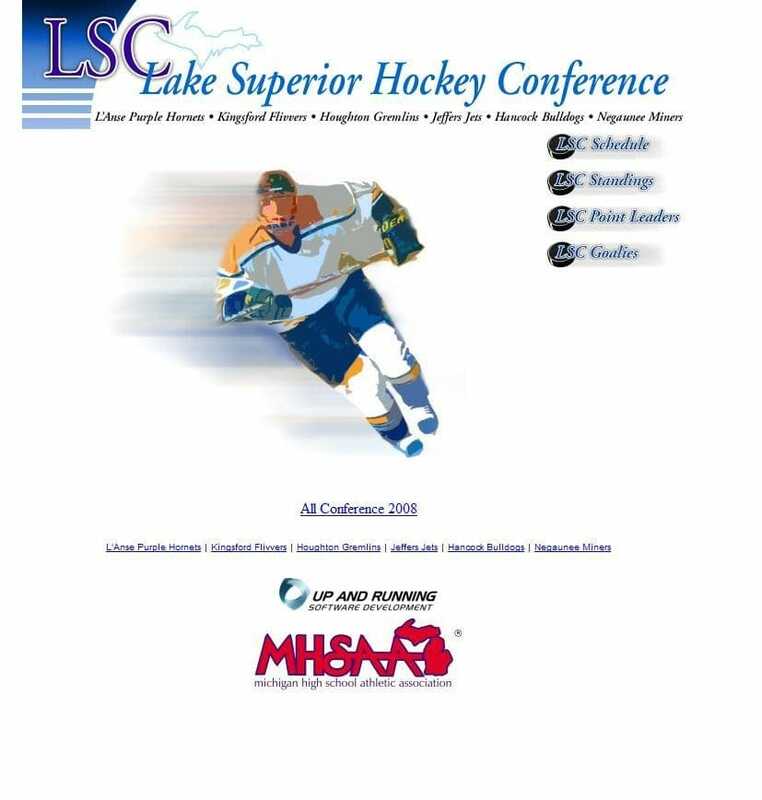 We've supported the Lake Superior Hockey Conference (L'Anse Purple Hornets, Kingsford Flivvers, Houghton Gremlins, Jeffers Jets, Hancock Bulldogs, and the Negaunee Miners) with free software development services. http://lschockey.com is a site that lets coaches manage stats and teams; the resulting data is displayed on the website dynamically. Our CEO volunteered at the US Ski Nationals in Houghton, MI in 2008, and had the honor of ensuring one of the first-place winners, Ivan Babikov, followed US Ski National policies. We've provided personal security and martial arts education to 100s of people since the 1990s. Our CEO taught it at the university-level, both formally as a listed class and as a club instructor. Our CTO also taught at as club instructor. Combined, we collectively donated thousands of hours to helping people of all ages and abilities learn a martial art for whatever purpose they joined, usually some combination of: physical skills and health, confidence, presentation and communication skills, self-development of a more conscious values system, and more. 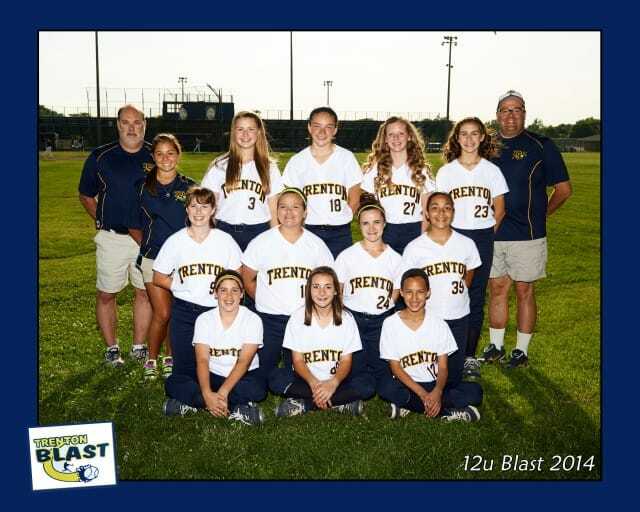 Up and Running has donated thousands of dollars to the Trenton Blast softball team since 2010. This was used for many things, such as specialized instruction, travel, and tournament-related expenses. 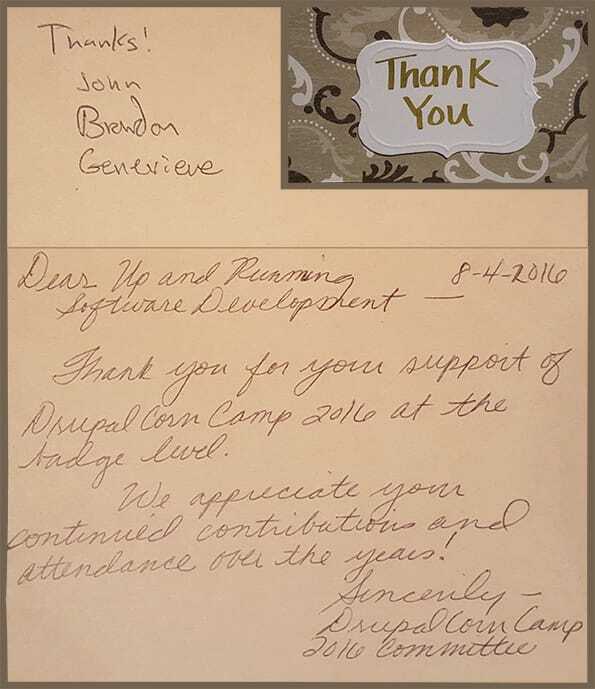 Here’s a thank you letter, a thank you email from a parent, and an image of the team. We've also donated technical services to the Copper Country Soccer Association, an organization "that provides an opportunity to play soccer for over 800 children from Houghton, Keweenaw, and Baraga counties. (source )"
Towards that end, we've provided free and in-kind services to artists and organizations that need help getting going. This includes free hosting, free technical support, and general business advice. In support of this, we've donated to large community dinners, fireworks displays, local community events such as BridgeFest and Winter Carnival, Shrine Circus, and more. Here are some other efforts we’ve supported over the years: we've donated time or money to other health organizations, religious organizations, small businesses, foundations, athletic organizations and clubs, government entities, artists, and other service organizations. Here are some of the specifics: Cancer Drives, Polio Plus, Dial Help, Polio Plus (eradication), Gloria Dei, OlearyFoundation.com, United Way, BHK Child Development, Omega House (senior services such as assisted living), local Fire Fighters, American Chung Do Kwan Limited (Tae Kwon Do Association), Hancock Bike Shop, artists who needed web space, kids who knock on our doors for fundraises of all sorts (cub/boy/girl scouts, sports, classroom sponsorship, etc. 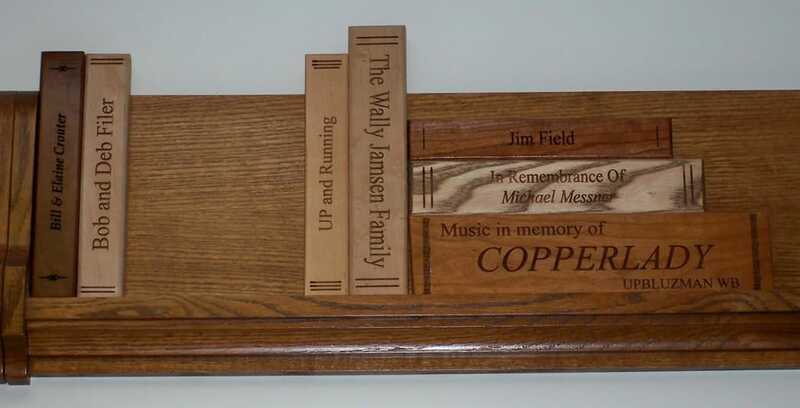 ), Copper Country Junior Hockey Association, Central Upper Peninsula (CUP) Hockey League, Western Upper Peninsula Healthcare Access Coalition (WUPHAC), Relay for Life, and Big Brothers Big Sisters. 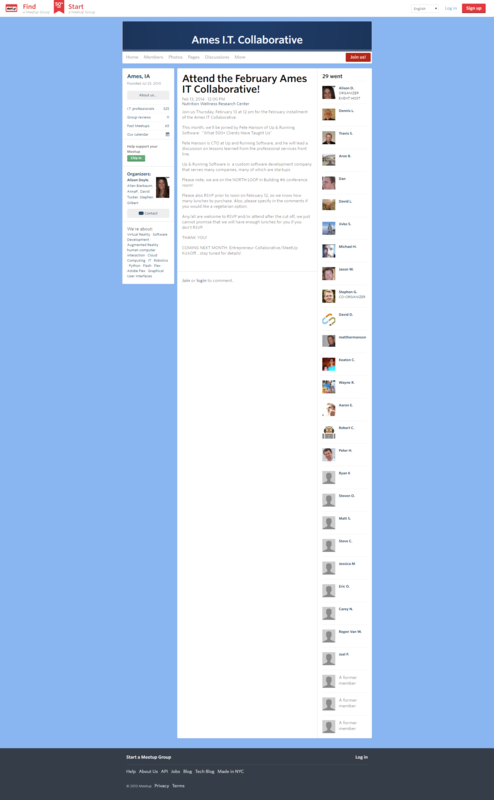 We've gone into some detail on this page to prove we mean what we say and did what we said we did. We know it’s easy to say you believe in something, but it’s harder to prove that year after year with documentation and consistent action. As we hope is demonstrated above, if it’s a good cause and we can, which is most of the time, we chip in. There are a lot of good people doing great things out there, and we’re honored to be able to help how we can when we can.